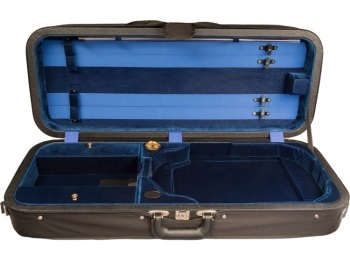 This adjustable oblong viola case offers the same benefits of the Bobelock fixed size B2005 but with the option of using the patented adjustable slide to fit any size from 15" to 17" with the same assurance that you have come to expect from Bobelock Cases: durability, protection and style with plenty of choices to satisfy everyone. Built using a combination layered plywood and styrofoam core case construction in the traditional oblong shape, the B2005 adjustable viola case is covered with a durable black nyloncanvas zippered cover and outside music pocket. Includes shoulder strap, hygrometer, humistat and instrument blanket. Four bowholders.